Want to be hired by Shelly? 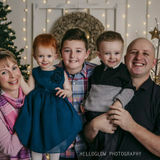 Hi there....I am looking for child care starting Feb for my twins who are three and my eleven year old stepson who we have every other week (who is very self sufficient). We also have a big, cuddly golden retriever. I work 3 days/wk and have daycare for two. My husband works different shifts and a lot of hours. I am looking for someone for Thursdays as well as the occasional extra time. If you love working with kids, interacting at their level, playing outside, doing crafts and reading I look forward to chatting more!